I love a blouse that can go from pencil skirt to skinny jeans with ease. I'm finding this type of top in the tab sleeve variety. There is a certain casual cool with this top that makes it easy and versatile. Just a stunning hue of blue. This will go with just about anything you want to pair with it. The details on this blouse are very well thought out. Great Mandarin collar, shoulder epaulets, and a shirttail hem line. This is a great upgrade to a plain white shirt, but it's simple and easy to layer. 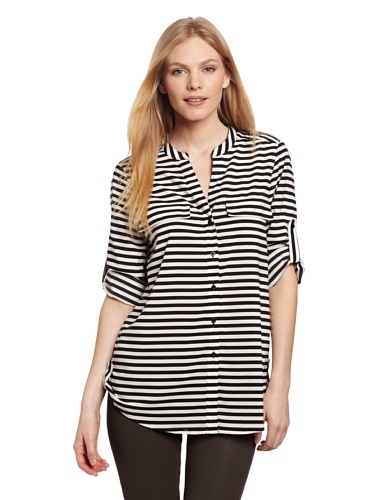 I love the continuation of the stripes on the sleeves, give a much broader shoulder. What do you wear that pairs for day or night? These simple but interesting blouses make it so easy to add one accessory or shoe for a completely different look. I have the Old Navy shirt and I love it! Black jeans, dark wash jeans, and hopefully green jeans if I can find the perfect shade to match the green stripe!